Merit360 is the biggest and loudest call to action concerning the 17 United Nations Sustainable Development Goals (SDG). This 10-month program will connect you with like-minded people from all over the world, guide you through a process of designing a human-centered solution to combat a specific problem of your chosen SDG. Starting with a virtual process to get to know your team and analyze your chosen SDG, followed by a face-to-face conference in the Philippines to afterward return to your home country and implement the 6-month pilot project! Together we can make the impact on a scale our world needs. 10-04-2018 / 21-04-2018 Offline Program full-time. 01-05-2018 / 31-10-2018 Implementation Phase Pilot Project 6 hours a week. Leadership Skills – including how to work in a virtual international team, communication and empowerment skills. Personal Development – Gain confidence and become more focused your life passion and purpose. A sustainable project plan – Each SDG group will develop a project plan to be implemented in global communities. Global Network – Connect across cultures; meet other young people from all over the world! 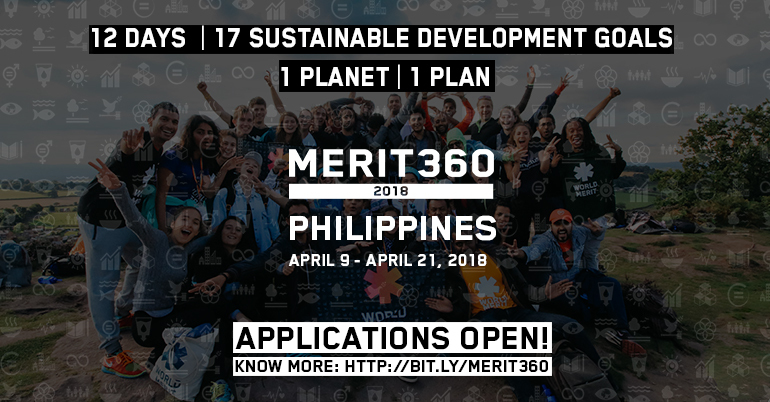 Connections with experts – Leaders of each SDG at Merit360 will mentor and support project ideas from participants. Everyone between the age of 18 and 35 who is passionate about the Sustainable Development Goals and want to commit time to make a positive change.